Good fun, let's do it again! ...In a little while. Lots of interesting and diverse stuff here. I love the bass sound on East German Boogie - there's something about the drum claps that reminds me of 'Arpegiator' from 'Concerts in China' ... no idea who or what though. It ought to be a moog with a bass like that. Mother 32? If I had to hazard a guess then I would say that 'Ghost Train Remix' was on something Waldorf-ish because of the HF content. But there's something that says 'Prophet' to me too. I guess that's shown up just how out of touch I am. And I think DaveB's track is Sweet Chance, but I have no idea what its recorded on. I thought I might have a slight advantage in that I have been in his studio, but he turns over so much gear that its no advantage worth mentioning!! On reflection it was the Matrixbrute not the Sub37. Ok, I reckon EastGermanBoogie is Dave B and Sweet Chance is Folderol. I have no idea about any others. But we can also assume that arkieboy didn't write EastGermanBoogie, GhostTrain Remix or Sweet Chance. Because he's a gent and would never praise his own submission in such a way, we can also assume that Folderol didn't write New Black Moon or X air on a C synth. Similarly Jumpeyspider probably didn't write EastGermanBoogie. New Black Moon or X air on a C synth. In conclusion, Mrs Peacock, in the library, with the candlestick! arkieboy wrote: ... DaveB's .... I thought I might have a slight advantage in that I have been in his studio, but he turns over so much gear that its no advantage worth mentioning!! In fairness, quite a lot of it stays and it's rare that things come and go quickly. At least quickly on my timescales .. Someone has got the right person to the right track. Nobody has got a synth right yet. In Chris's case, initially even he got the synth wrong for his own track! I'll post the results after the weekend. I think that there may be a couple of surprises. I guess it shows the breadth of sound from modern kit - only 1 'vintage' synth in the whole lot. And I think I'm right in saying that there is no moog - of any kind - in here. Mini or otherwise. Sorry not great at naming the synths but can I just say how much I enjoyed giving this a go. I learnt more in a month than I have done in ages! And not just synths, listening to others and then thinking why does my mix/master sound so bad. I had never even heard of an LUFS before let alone what the impact was (In fact it was a response the Hugh gave to another query that really helped). With some of the tracks up I'm still thinking how did he make that sound so big and clear. Obviously I still have a lot to learn and this was a great way of doing it. OK gang, it's time for the results. Hopefully this was fun for people both taking part and just having a listen. Now you can listen again but know what to listen out for! * Are Friends Electric was by Jumpeyspyder and was performed on a Crumar DS2. I'll let JS explain the hell involved in creating that! * Cars is by ArkieBoy. There were some sampled drums from Addictive Drums, a couple of SDS5 samples, but all of the synth parts were created using VRM modelling on the Roland VG99 guitar processor! * Ghost Train Remix was by Folderol using Yoshimi for everything! * New Black Moon was by Marky C. He used a Roland TR8 for drums and Access Virus for the synths. * One Synth Project Master was by Richie Royale. The entire thing was done on an SE Boomstar 3003 - the TB303 filter one. Wow. Bet there's some raised eyebrows for that lot. From my point of view, once you know you can start to listen out for the tell-tale signs, but it's still tough. Top marks all round for the programming and arranging. As for my own offering, I can only go on the record as offering a truly heartfelt apology to the whole of Germany and hope they saw the funny side. Best thing I've seen recently is The Elf's reaction to the track - he laughed so hard I thought he was going to hurt himself. Quite a few surprises there, although i should have guessed yours would be the er... 'unusual' one I would never have guessed any of the others, ether the composers or the synths used. Are Friends Electric -> I think it needs more movement for that length. Cars -> Strongly reminds me of something much older but can't remember what it was (an age thing maybe). Liked it. EastGermanBoogie -> Nuff sed (actually the music itself is not bad at all). Ghost Train Remix -> Moving swiftly on, but delighted no one seemed to cotton on. New Black Moon-> I really enjoyed this one. We'll have to keep an eye on this guy! Should probably be played at 11, driving an open-frame kit car across a mountainside. One Synth Project Master -> Some nice details in this. I'm guessing it's aimed at the Trance genre, so I found it a bit repetitive from a listening point of view. Temple of Gatedom -> This sounds extremely 'modular' - so I would have got that quite wrong. Oh well. Dave B wrote: * Are Friends Electric was by Jumpeyspyder and was performed on a Crumar DS2. I'll let JS explain the hell involved in creating that! OK, time to explain/ (Make excuses ), since I had so much help and support repairing the DS-2 from this forum, it seemed fitting to use it for this challenge. "not a problem - I 'll sequence it.."
I think, I could use the gate to sequence each individual note just like I did with the drums parts. a/ Do not use this method, unless you are slightly deranged - or want to be ! b/ Unfortunatly, I didn't pay enough attention to minimising signal path / ground loops. c/ having to put sounds together without knowing how the end result will be is very hard. eg My strings sound was sounding good in its lower registers but only discovered how piercing it was up high after I'd spent hours putting it all together. All in all, Its not perfect but apart from my rather poor/rushed mix, I'm rather proud of it ! Ah! Didn't realise just how much effort was involved. I doff my hat to you sir! Whereas I cheated extraordinarily and knocked mine up in a weekend. By cheating I mean that all the sounds come from Xpand!2 but I used some questionable methods to create the triggers. The drum track was created by taking some grooves from the Manda Audio power drumkit, muting that and sending the midi signal to an Xpand track. The bass was interesting. I played it initially on my upright with a DI signal in, with the intent to apply jamorigin's midiguitar software - but it can't cope with a bass signal. So I then re-did it with a guitar, which worked fine. 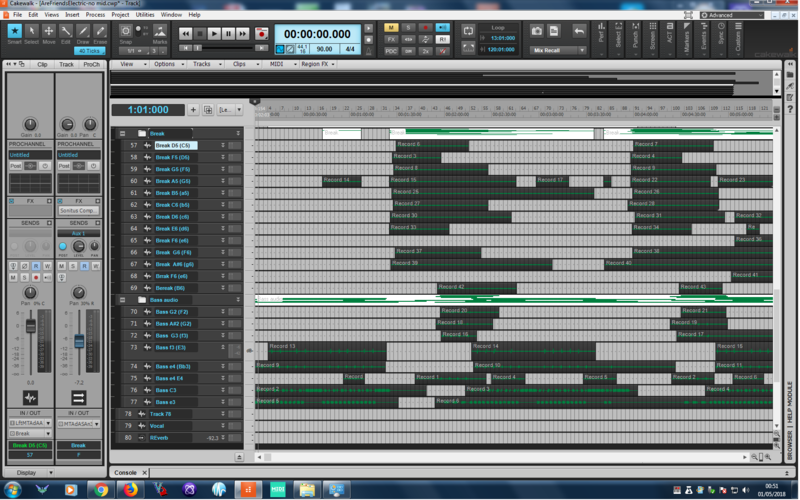 Again, muted the original and sent the midi to an Xpand track. The organ tracks were just straight from one of the XPand presets, the chords were played into a keyboard (hence it's in C ) with the lead part via a guitar and jamorigin again. Same trick for the guitar parts. I also tried using jamorigin on some sung parts, wasn't much cop but sort of works for long oohs and aaahs (with a bit of autotune). There's then a pad that ascends throughout where I automated the levels of the various parts throughtout the track. Learnt a bit and had fun. Top work for suggesting and organising Dave B. And thanks to everyone who took a bit (or a lot!) of time to play along. Me? I learned an important lesson : always check out the capabilities of a synth before trying to use it for everything! The Leipzig is a monster in every sense of the word. I can't listen to it with headphones on as it feels like something is mugging your ears - the sheer power it puts out (even at low volumes) is incredible. For bass parts it is unequalled. You don't get the 'brassy' kind of sound you get on a moog but it's got the sheer weight of sound to really push it forward. Chevytraveller once described it as a 'Pro One killer' and he has a point. The Pro One really excels at bass, but this thing just dumps on even that from a great height. It has a cool 8 step sequencer which can be triggered a couple of ways - including when a midi note is played. So I faked sample and hold that way. That's something that I feel more synths should have. Where it tripped me up was in a couple of areas. The filter is brilliant (as The Elf points out, high resonance doesn't clog the low end) but I really do feel that it needs a HPF to tame some of the earth shattering-ness of it. The oscillators don't have octave skipping and the 2nd oscillator detune is quite fine / narrow. And I just could not get a square wave out of it - a 50% pulse should be a square, but I just couldn't find the sweet spot. The 'sub' was perfect though, so it could be my abilities at fault. I had planned on trying to subtly throw in some Roland 'square + sub' type sounds to see if that might throw people, but I couldn't get close. Like I said - a monster. So what's on the track is pretty much just the raw synth - no eq or dynamics, although I flanged the 'chords' using the stock Logic flanger. And I think that I had my usual stuff on the mix bus (brickwall eq, compressor, exciter, limiter, meter) but I don't think it was working hard. 2. The more I thought about it, the more convinced I was that if I was forced to just use one of my (analogue) synths, I think that it would be the Odyssey. That isn't perfect, and I'm still not completely sure how to tune it ( ) but it's simple, yet flexible, and sounds great. And that's from a dedicated Oberheim man! Oh .. and for Desmond's benefit : No Kurzweils were harmed in the making of this track! Oh well, here goes. Mine was rather more than a remix... more like a saga. First of all, I've always been a stickler for keeping records - just as well! The original composition was in 1993 using a Yamaha SY22 and a rather obscure sequencer on the Acorn Archimedes. That basic 3 note rocking background was a nightmare to play for an entire track, so I took a step to the dark side and recorded just one verse, then quantised and duplicated it. The Bass was (I think) purely edited and also quantised. Most of the other tracks were played through and timing-wise pretty much the same now as they ever were. Some years later I got hold of a second-hand SY35, which had almost (but not quite) identical sounds, but this and a few other tracks sounded reasonable-ish. Also, I'd only just started to develop voice patches, and didn't have any suitable for the main lead and harmony tracks, so it ended up a mixture of Zyn, and SY35. Fast Forward to now, and it's totally Yoshimi. The whole mix is much clearer than it was - most 'instruments' have been changed, and there are a couple of completely new tracks including the percussion that fades in on the last verse. That 'drum kit' is courtesy of one of Yoshimi's little band of helpers and is mostly filtered noise in the SubSynth engine. Total number of tracks is now 15. Spread instruments across the audio spectrum more evenly. Be careful about over-use of reverb. Try different sounds even when you think it's OK.
For anyone interested I put the 2007 version up on SC a few years ago. If you're really interested I still have a flac copy of the original! * Cars - ArkieBoy. - Roland VG99 guitar processor! * One Synth Project Master - Richie Royale. SE Boomstar 3003. Not heard of this synth till today - sounds great, love the way this is put together rhythmically! The most rounded , but least synthy sounding track , it sounds like a group of guys playing - lots of feel in this track.